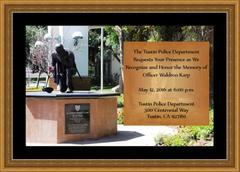 As part of Law Enforcement Memorial Month, the Tustin Police Department will host our annual ceremony honoring the ultimate sacrifice made by Tustin Police Officer Waldron "Wally" Karp. The ceremony will take place this Thursday, May 12, 2016 starting at 6:00 p.m. Please join us as we pay tribute to Officer Karp.